Anabolic Steroids tempt one of the most commonly held desires amongst people of today’s society, which is why this drug is popular with teenagers as well as adults. The desire to be more beautiful, faster and stronger is perfectly normal. We all wish we could be a little more of these things. The difference is in how we deal with these desires, how we get to where we want to be. It is common knowledge that to become better at something takes hard work and dedication. However, when presented with a possible ‘quick-fix’ by popping a pill, desire and temptation can override rationality and common sense – and opens the door to drug addiction. This is the key reason why anabolic steroids are abused: the desire for a short-cut to self-improvement. Q) Why are they Used? A) They are synthetic alternatives to the natural male hormone Testosterone, which is responsible for the development of a man’s masculinity. ‘Anabolic’ comes from the Greek, meaning ‘to build’, which, in the case of, refers to muscle. By encouraging the body to collect protein from ingested foodstuffs, Anabolic Steroids increase the amount of energy the body uses in creating and building new muscle. It is for this very reason that the drug is popular amongst athletes. However, the authorities of most competitive sporting events strictly prohibit the use of steroids by any participating athletes. This is enforced only on the basis of the drug giving an unfair advantage, whereas the main reason steroids should be prohibited is that they are extremely dangerous to health and wellbeing. These facts are particularly worrisome when you consider that a growing number of abuse in school children and teenagers in order to achieve a more athletic physique and, therefore, more popularity amongst friends. 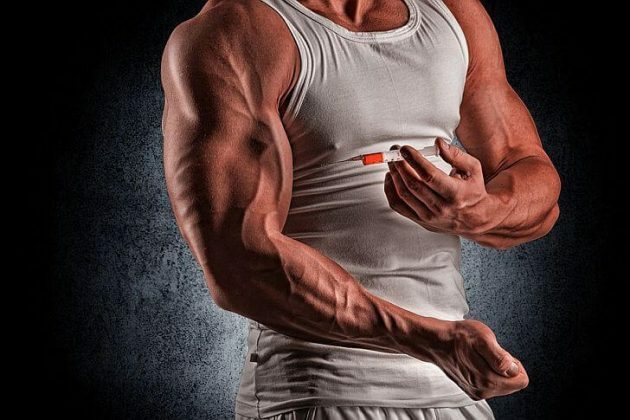 Q) What are the Effects of Anabolic Steroid Abuse? A) They are generally injected, though there are a vast number of other methods of self-administering the drug, such as orally, nasally (spray), transdermal administration (patches, creams, etc.) and even implants that remain under the skin. The price of achieving increased body mass and optimum muscle building conditions is high. Common side effects include liver damage, tumor formation (benign and malignant), increased risk of cardiovascular diseases, increased blood pressure, hair loss (often leading to Alopecia), acne, hallucinations, confusion, insomnia, diabetes and an increase in aggressive behaviour. 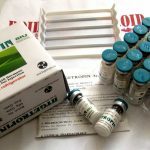 Because anabolic steroids are based on the male hormone Testosterone, which has a large role in male physical and sexual development, abuse of this drug can have damaging effects on the sexual reproductive system of both males and females. For example, anabolic steroid abuse in males leads to low sperm count, increased abnormal sperm production, testicular and erectile dysfunction and even breast formation. 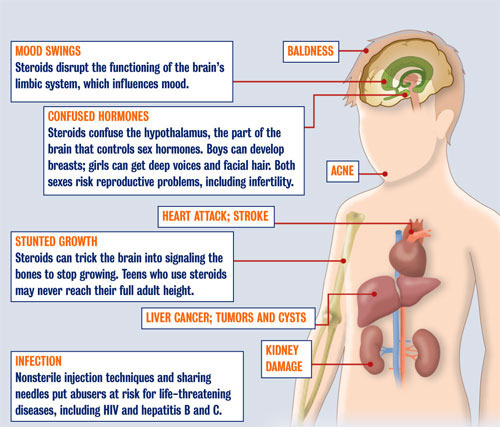 In females, the drug abuse can cause amenorrhoea (disruption of menstrual cycle), hair loss and masculinisation in the form of decrease in breast size, increased facial and bodily hair growth, deepening of the voice and even male pattern baldness. Q) What is the Treatment of Addiction? A) The addictive behaviour of anabolic steroid abuse can be treated successfully if the abuse is considered to be an addiction. Because of the euphoric effect associated with anabolic steroid abuse and the occurrence of withdrawal symptoms upon stopping the abuse, they are classed as addictive substances. Drug rehab centers offer addiction recovery programs specifically for the treatment of anabolic steroid abuse. This treatment varies according to the severity of the addiction and the subsequent changes that the addict has undergone as a result of the drug abuse. Supportive therapy may be sufficient in encouraging the addict to consider the long term effects of abuse and address the symptoms he may experience as a result of withdrawal. As depression, muscle and joint pain and erratic behaviour patterns are common during anabolic steroid withdrawal, medical and behavioural treatment may be necessary. Fortunately, the majority of the damage done to the body and mind through abuse is reversible, but only by choosing a well suited drug treatment and rehabilitation center operated by the most specifically qualified professionals.